MOSCOW, Russia -- A Ukrainian military pilot, Nadia Savchenko, who has been held in Russia since June 2014, faces a 25-year prison term, according to reports. Nadia Savchenko, seen here at a hearing in Moscow, went on hunger strike for 83 days. The charges against her have been upgraded to "joint perpetrator of murder", according to Interfax. She will be tried in a border town in southern Russia, her lawyer tweeted. The pilot was captured during fighting with Russian rebels in eastern Ukraine and has become a symbol of Ukrainian resistance to Russia. She was previously charged with being an accessory to murder, in relation to the deaths of two Russian TV journalists in a mortar attack in the rebel-held Luhansk area of Ukraine. However, Russian Investigations Committee official spokesman Vladimir Markin told Interfax that her actions had been "reassessed". "She will now be tried not as an accessory but as a joint perpetrator of the murder of two or more persons by means (of) posing danger to the public, motivated by hatred towards a social group and carried out by a group of persons acting in collusion," he said. 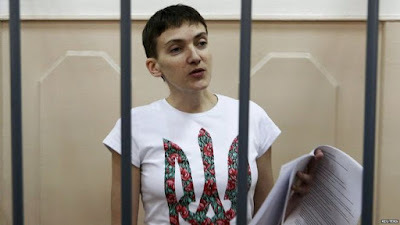 The alleged crime carries a maximum life sentence, but Russia does not give life sentences to women, so Ms Savchenko faces a 25-year jail term. The pilot, who was previously on hunger strike for 83 days in protest at her detention, has denied the charges. The EU and Ukrainian authorities have repeatedly called for her release. The Ukrainian government says Ms Savchenko was abducted by pro-Russian separatists and handed over to the Russian authorities. But Russia says she crossed the border herself, posing as a refugee.